Former advertisement manager on The Sporting Life, DEXTER ADAMS, died on January 31 (2015). 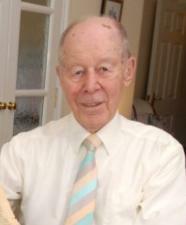 Dexter, who also worked in the ad department on the Daily Mirror, would have been 90 in April. JOHN French writes: “Dexter Adams joined Mirror Group 1957 as a sales representative in the advertisement department and was well respected by all of his colleagues. He was promoted to sales manager/group head, looking after some of the Group’s biggest advertisers and their advertising agencies. Later Dexter was approached to take on the role as advertisement manager of The Sporting Life. He relished the challenge and joined The Sporting Life in the early 1980s, staying until he retired in 1990. Obituary – with thanks to the Stamford Mercury and Barnet Press: Dexter Adams was well-known as an amateur player for Hendon Football Club and was also capped by England 20 times. He was manager of Barnet Football Club from 1962-70, taking the club into the third round of the FA Cup in 1964-65. He oversaw the club’s transition from amateur to semi professional status in 1965. He was a member of the Great Britain Olympic squad in Melbourne in 1956 but was flown home after getting injured. Dexter met his wife Sheila when he was working as a surveyor and she was a secretary. The couple had three daughters Gail, Dawn and Clare, and have five grandchildren and one great grandchild, and celebrated their Diamond wedding anniversary in 2013. BBC soccer commentator John Motson, who began his journalistic career on the Barnet Press, said Barnet’s manager played a decisive part in his career. “I was deputising for the Barnet Press sports editor, who was away at the start of the 1967-68 season. Dexter said to me: ‘I like what you write. You should try to get on to a bigger paper.’ The next thing I know Dexter had spoken to Ken Jones, then the Daily Mirror’s number one football writer, who said I should aim to get on to a provincial daily paper. That was a significant moment in my career and if Dexter had not taken an interest in me, who knows what may have happened.